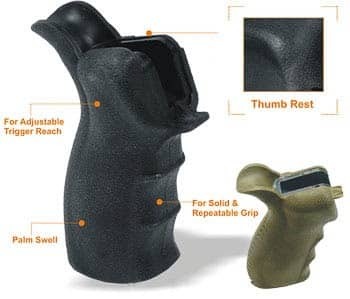 AR15 Ergo Style Pistol Grip – A robust ergonomic pistol grip with palm swell, thumb rest, non-slip texture & plug. Ergonomic finger grooves provide solid and repeatable grip. Additional hand support provides stable and easy trigger control. Very well designed to offer great comfort and better control. Increase shooting performance and accuracy.